Most people go all out for Spring cleaning, but my big cleaning craze is during fall. Before we are all shuttered up in the home, and stuck there for the next 6 months, I want to make sure everything I will be stuck with is clean and organized. But, if you are cleaning larger items, you can do 1.5 cups soda to 1 cup water. Dab a bit of paste onto a soft cloth and use the cloth to rub in the paste. You may need to rinse and reapply the paste to get your desired shininess. When as clean as you want it to be, rinse and use a dry soft cloth to polish the silver. 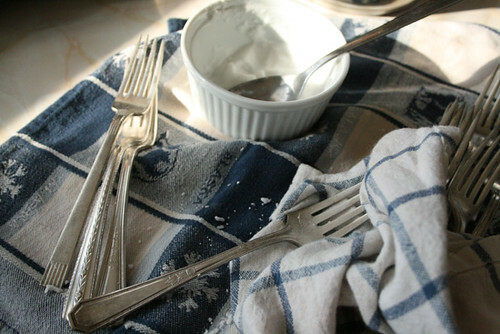 For really stubborn tarnish, you can sprinkle baking soda directly onto a damp cloth and rub it on the silverware until tarnish is gone. Rinse and dry well. For my next round of cleaning, I hope to make a batch of spoon oil and whip my wood kitchen utensils into shape. More info on that when I finally find time to make it! My lovely guest writer, Elide, covered the foundation garments that preceded garters during the 1910s in Part 1 of this Everyday Vintage subject. Now, lets delve into garters themselves and the many variations they took during the 20s and 30s! Even though women's fashion changed dramatically from the 1890's to the 1920's, the need for an undergarment to help achieve the ideal figure did not. It seems that corsets merely evolved to follow the fashion and never completely went away. A woman could therefore hold up her stockings in the twenties by clipping them to these new foundation garments with suspenders similar to the ones that were attached to corsets. Because of the popularization of the slender, boyish figure, many women who were not naturally proportioned in this way (ie, the majority) wore a foundation garment that came down over the hips. These girdles had much more elasticity than the traditional corsets,and advertised greater freedom of movement. garter belts of the thirties. I also uncovered another option for keeping up stockings; roll garters were used by folding the welt of the stockings over the elastic and rolling tightly down. These garters were made from an elastic core with a woven exterior of cotton or synthetic threads. 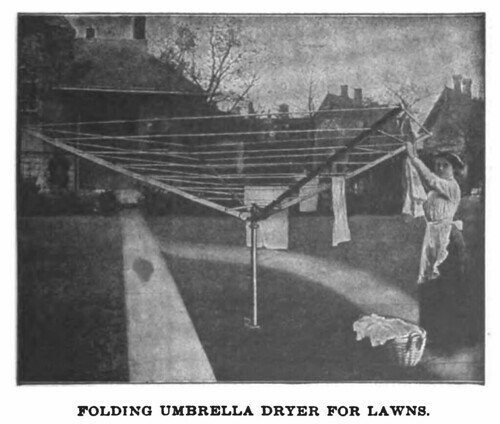 The term 'rolled stockings' refers to this method. As compared to the corset, I found there is far less readily available information on this particular accessory. So far I've been unable to find much regarding their degree of comfort or popularity, although a patent search on garters yielded up some great information. First, most of these patents were applied for in 1925. Rolling one's stockings was done in warmer weather and all mention of the practice I found in the patent documents indicates that stockings were rolled below the knee. It makes sense that if one's stockings were going to be worn that low, clearly the girdle/ garter belt option wouldn't be the best one. What also seemed to be consistent was the desire for ornamentation at the top of the rolled stocking, if it was going to be that low, it was going to be very visible. Most of the patents discuss a need for keeping the stocking up, the back seam centered, the roll in position and a decorative element to add appeal. One of the most surprising things I learned in reading these patent files, was that the roll at the top of the stocking was desired as a part of the ornamentation. I really thought the thick roll of fabric was an unfortunate but unavoidable side effect, but I found patents alluding to "the rolled effect now in fashion" (patent 1,575,631). I also found more than one patent to produce a contrasting colored roll by means of differently colored fabric integrated into the stocking welt, or a cuff-like device worn over the stocking. There was also more than one patent for a silk garter wide enough to cover the roll in its entirety. I come away from all this information with the thought that non-elasticized hosiery was enough of an issue in the 1920s for there to be several patents filed for devices that allowed women to not wear a girdle or garter belt. Second, having some type of ornamentation at the top of one's stocking was extremely popular and wearing silk garters in addition to elastic garters was very likely. Curiously, you can still find roll garters today through costume supply companies. So in the name of research, I ordered a pair. I personally found them to be like wearing socks with a strong, heavily elasticized top. Since I have yet to experiment with wearing them all day (humid summer days do not lend themselves to all day experiments with stockings), I don't know if they hold up well. However, I think the combination of roll garters with silk garters would be pretty solid and I found an illustration depicting this method. I want to thank Elide for writing these two posts and sharing all her vintage garter knowledge. 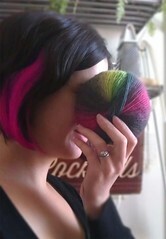 You can find Elide on her blog and her Etsy shop. Chicagoans can see Elide & her garters in person this weekend at the Randolph St. Antique Market. If you couldn't tell by the topics I cover on this blog, I really enjoy learning about the little everyday things of days gone by. Sometimes though, I get super curious about an area of vintage living that I don't know much about. That is when I need to call in other vintage enthusiasts. When strapping myself into a garter belt or rolling garters over my stockings I always wonder how woman of the golden era wore these things everyday and just how functional these items actually were. Around this time of pondering Elide of Previously contacted me about being a guinea pig for her line of garters to test the functionality of them in my everyday wardrobe. What perfect timing! What I found in my back & forth with Elide is that she really knew her stuff about garters and foundation garments, to the point where I almost wanted to take notes while reading her emails! I thought that you, my lovely readers, would also be interested in Elide's garter knowledge so I asked her to write a guest post and she agreed. Below is Part 1 of her guest post on garters. The process of researching and recreating garters made during the 1920's has led me down a few interesting paths. One question that kept coming up though, was how functional were the garters I was trying to replicate? It seemed doubtful to me that women were only wearing garters such as these to keep up their stockings. If that were the case, what else could they have been wearing? To answer that question, I starting looking into the types of hosiery that a woman might have worn at that time. Stockings in the 1920s were made from silk in the early part of the decade. The addition of rayon stockings in the later half meant the sheer look that silk provided became more affordable. Both types of stockings were usually fully fashioned and had no elasticity, which meant they needed something to hold them up. In the early 1900's women were wearing corsets, which had suspenders that clipped to the tops of their stockings. I knew that garter belts came along at some point in the first half of the 20th century, but it wasn't an undergarment that I associated with the twenties. Keep your eyes peeled next week for Part 2. Elide will cover how the corset changed in the 1920s and the entry of garters, complete with patent illustrations of garter inventions. So, earlier this week in Part 1 we set-up the wash space; now its time to get the soap going. Let us review what our tools are: kettle or pot to heat a small bit of water, soap flakes, large bowl or wash tub for rinsing, and distilled white vinegar. I keep my vinegar in a bottle dropper for doing the wash because it is easier to put just a wee little bit in the rinse water this way. We have the space set and our tools at the ready, so lets get our soap flakes diluted. In order to do this, I boil some water on the stove and put the soap flakes in a cereal bowl. 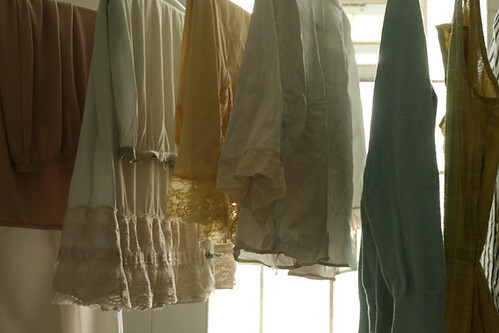 While waiting for the water to boil, separate your clothes into batches of light colored and dark colored clothes. I normally keep blacks, reds, and new dark clothes in a batch by themselves. When the water is at a rolling boil, I pour about a cup of it over the soap flakes. Use a spoon or fork to stir the soap and mix until they are dissolved. You can add more water if needed. While the soap is dissolving, fill your sink or wash tub with warm to hot water. When the flakes are pretty much dissolved add them to the sink/tub and swoosh around with your hand. Add the first batch of clothes you want to wash, the lightest colors you have. Sometimes you will just have two batches, sometimes more. The key is to keep the darkest clothes, or the clothes you think will run, to the very last batch you put in the wash water. Mix the clothes into the water and work on any clothes that have stains. Let soak in water for a few minutes. When done soaking, squeeze the excess water from each item and place in the rinsing bowl. When the batch is out of the wash, add water from the tap to the rinse bowl and swish clothes around. Dump water, squeeze excess water from the clothes, and put back into the rinse bowl. Add more water and a few drops of the distilled white vinegar. This is to remove any soap residue left behind. It does not leave any odor if you use a little, hence why I use the bottle dropper to prevent spilling accidents. Swish the clothes around, dump water, and squeeze excess water from clothes. Do one more rinse with clean water (no vinegar) and then hang clothes to dry. Before starting the rinse, you can add the next batch to the soapy water and let it soak while you rinse out the previous batch. The world is your oyster, in terms of hanging the clothes to dry. You can use a clothes line outside or hang on a folding rack on your patio. I put my clothes on hangers and hang them by the shower curtain pole. Ah the life a girl in the city with no backyard. I hope you found this topic of Everyday Vintage Life useful. Keep your eyes peeled for the next topic in this series, which concerns a luxurious item of clothing that used to be part of a woman's everyday wardrobe. Summer is the perfect time to wear vintage dresses, but how does one care for them after wearing? 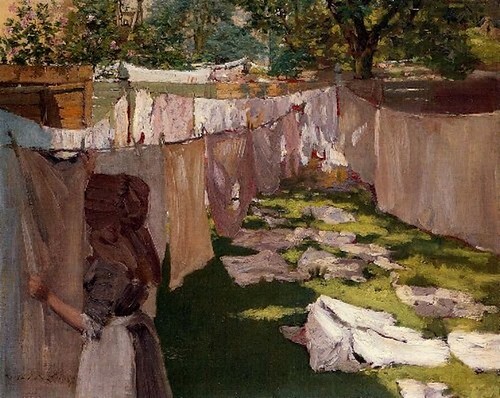 I went over some basic history behind wash day in the Laundry post of the Everyday Vintage Life series and mentioned that many of us wonder how we can translate this history into something useful for us today. So here is the post I promised to you then about how I do my hand washing. As I said earlier, I am going to go through how I do my hand washing. You can certainly use Woolite or some other liquid soap, but I use soap flakes, which require some extra steps. I use Marius Fabre soap flakes (5th item down) because I like that it is natural, has no fragrance or color, is biodegradable, and that the packaging is recyclable. There are plenty of other soap flakes to choose from (1, 2, 3) and you can also make your own (one recipe here, scroll to bottom). I do keep a liquid soap for really quick, small batches of hand washing, but when I do my normal washes, I use the flakes. We've gone over wash tubs in the Everyday Vintage Life posts on dish washing; I use one here to rinse the wash. Actually, what I use a very large mixing bowl (think industrial size) that I got from Target. 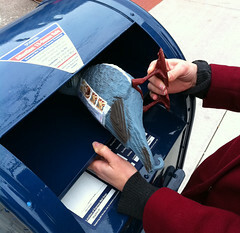 So, see what you have around that house that you can re-purpose for this use. With the tub/bowl being used for the rinsing, I use my sink for the actual washing. If you are going to be doing washes that are too large for your sink or you have a problem with the stopper, then get two bowls or tubs; one for washing and one for rinsing. I do my hand washing in the bathroom, with the rinse bowl in the tub near the bath tap. If you have a large or divided kitchen sink, you can definitely do this in your kitchen. So now that we have all the tools and the set-up, what do we do on washday? I'll explain my hand laundry process this Friday in Part 2. 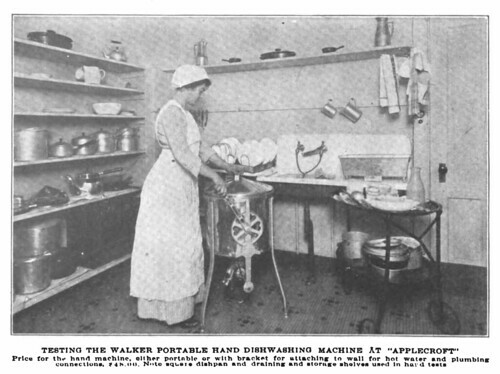 I do realize Jitterbug's post doesn't address hand washing clothes, but I think all her laundry posts do such a great job of explaining the history and the task itself that I feel there isn't much to add. With that, I do realize there is plenty of us who wonder how to translate this history into something useful for us today, so I've started putting together a post on how I hand wash items. Yes, I know, not historical, but most of our hand washing today is for delicates, vintage items and stockings - not every bit of clothing we own. 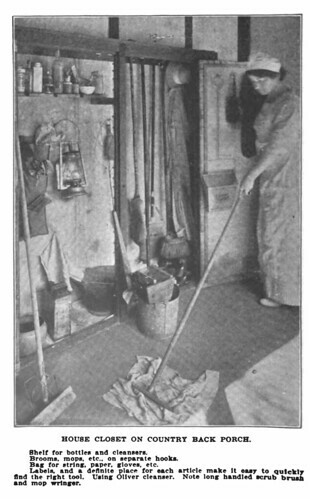 While I'm compiling this post, here is a book Eva Girl found to tide you over on that topic to feed some of your curiosity: Household Engineering: Scientific Management in the Home (1920). The section on laundry starts on pg. 211. Its been digitally archived as a Google book, so it is free for you to flip through and download, but shall we look at some interesting bits together? Since our last Everyday Vintage was on dish washing, I thought you would get a kick out of this portable dish washing machine. Both of these drying stations are quite clever, though I really like the one on the right. 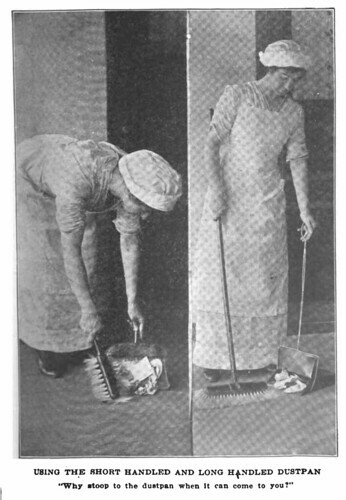 This is pretty much the technique I use to mop my floors. I gave up my mop years ago and have never looked back. I love this idea of a prep table with a peelings bucket. I use a large mixing bowl for my food scraps while cutting/peeling so I don't have to hunch over the trash bin. 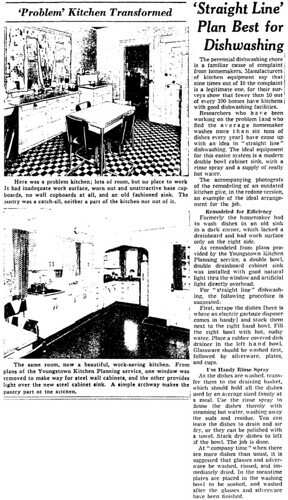 Here is an article from Chicago Daily Tribune June 18, 1950 title "Straight Line' Plan Best for Dishwashing" that I thought you all would like to read. Click to view full-size. First off, I want to say thank you to all of you who commented on the last post. 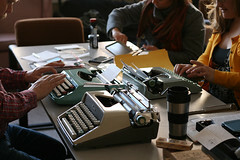 I am happy to see there are so many ladies interested in these little everyday things from times gone by. I was sure no one would be interested in my crazy history nerd musings; I am glad I was proven wrong. Thanks everyone! OK, so we went through why housewives of the past used a dish tub for washing up, now what was their dish washing technique? The tools you need are few: dish towel and dish soap (recipe for hand and machine soap here). You can also use a washing tub if you have a large sink bowl, but you can also just fill your kitchen sink, seeing as most of us use the kitchen sink mainly for washing dishes and don't have to worry about dirt. The dish towel for washing can be a clean rag, an old shirt cut into squares, or a scrubby cloth like this or these. I love using a wash cloth for dishes over a sponge because you can just wash them when you are done and not worry of germs and so forth. (You can also reuse the cloth to wipe down counters, clean the tub, etc.) If you don't want to make your own dish soap, ladies of the past simply used soap flakes, like Ivory. (Ivory discontinued their flakes in the 70s, so you would have to grate your own.) Some companies still make soap flakes for dish washing, like this brand, but I haven't used this company's products. I use liquid dish soap and am a fan of Method dish soap. So now that we got the tool options down, lets go to the actual process. Fill one side of your sink or a washing tub placed in your sink 1/4 full (to start) with the hottest water you can get from your faucet. Mix 1-2 tablespoons of dish detergent (if using soap flakes, follow the box directions). While tub/sink is filling, scrape all food from your dishes and pots and pans before soaking. Fill pots and pans with warm water and set them aside (don't put them in the soapy water bath). Immerse dishes into sink/tub bath. Ready for some actual washing? Rinse off any remaining food and use a scraper for any stuck-on food. Wash all items one-by-one, rubbing with the dishrag while they are immersed in the dishwater. Let the finished items sit stacked up in dish bath until you've finished that set of items (plastic, glasses, etc). When you've finished a wash set, turn on your faucet slowly and rinse the washed items. Let the rinse water go right into the dish bath. Put items into a drainer or a clean dish towel to dry. Clean each set of items using this method.By the time you are ready to wash you set-aside pots and pans, the dishwater will be near the top of the tub/sink from rinsing. To combat the extra grease of pots and pans squeeze a little extra dish soap on the dishrag. Use this water to wet the dish rag and wash pots and pans in the other side of your sink (if you have one) or use the counter. Do not immerse the pots in pans in the tub, unless you do not plan to reuse the water. Reuse the dish water? Yeah, this may sound weird to some, but after you've finished washing all of your dishes, you can use the dishwater to wipe down your kitchen counters, cabinet tops, and the stove. The reasoning is that the water isn't really that dirty since the food was scraped and rinsed away and of the large amount of soap used for the bath. When you are all done, drain the tub/sink and wipe down your sink. 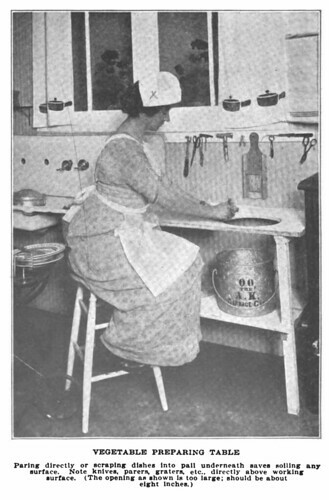 Resources: EHow "How to Wash Dishes the Old Fashioned Way." So, as some of you may already know or have realized, I'm crazy about the everyday lives of those who lived in the 1930s and 40s. The small, seemingly insignificant things that were so normal then that they didn't both to record the meaning or process, yet we have almost lost it today. A good example of this is the simple act of getting dressed. There were many types of social rules as to the length of a woman's skirt for day wear, versus street or evening wear. This is something that The Painted Women writes about in depth in a recent post. So, in flipping through my vintage magazines, I see a lot of these everyday things within advertising or the home editorials (none of which I can find now, when I need them, to scan in and show you all). Placing a metal tub within the kitchen sink to wash dishes. As a person who does not have a dish washing machine, this intrigued me. After seeing this over and over again, I wondered why this was a common practice during the 30s. I thought that perhaps they didn't have a way to stop the drain, but I realized this was silly as they took baths to wash themselves. So, I did some research and thought that you all might be interested in what I found. I will be breaking my findings into two posts: one will be about the why and what and the second post will be the how. So now, why would they place a tub in their perfectly well-working sink to wash dishes? I mean, isn't the sink where one washes? Well, back in the day, the sink is where most of the washing water was coming from. So things like clothes and the dog were getting washed in the kitchen sink. Putting a tub within the sink was just a matter of hygiene to keep that dirt separate from what you eat food from. There is also the matter of frugality. Most sinks were made from porcelain and had one large bowl. For one to fill the entire large sink with water would be a waste, and what if the dishes hit that porcelain and cracked? Placing a metal tub in the sink would create a smaller soaking area, create a secondary area for clearing food bits off into, and would protect dishes from getting chipped. Ah, those clever housewives. So then what was the housewife's technique for actually washing dishes back then? I'll break that all down for you next week along with what tools you need.